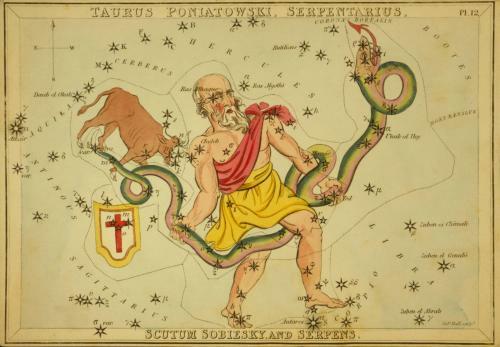 Barnard's Star is one of the 5 stars that form Poniatovski's Bull in the constellation of Ophiuchus. Together with A, B and C Centauri, and with Sirius, this Red Giant is one of the closest neighbours of our Sun. It is only 5,9 light years away, making it closer to us than Sirius is. Most sources talk about a humanoid race. According to the Branton Material, like Earth, they would not have chosen any side yet in the Galactic wars. One source, quoted in the Branton Material, claims that Barnard's Star is one of the home systems of the Large Nosed Greys (The Eban), but this isn't confirmed anywhere. [Most sources mention Betelgeuse, instead]. Contactee Hal Wilcox talks about contacts with "normal" humans from this system. Another source, again quoted in the Branton Material, mentions a race of "humans with red hair" that he calls the Orange. Dr. Richard Boylan mentions a race called the Altimarians. Altimar would be a planet that circles a red dward sun that would belong to the same system as Barnard's star. At present, no such red dward has yet been discovered, nor does anybody else mention Altimar. 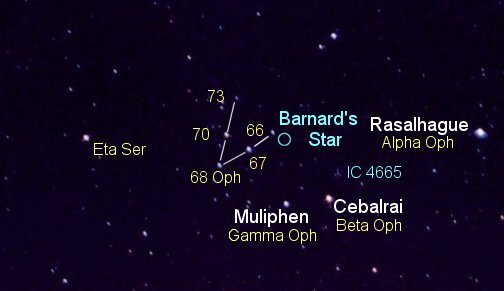 Trivia: One of the alien races in the TV Series "Roswell" would be from Barnard's Star.